Need a last minute gift for that special someone? Elebash’s is open for extended hours for all your jewelry needs. Our extended holiday hours are as follows: Friday December 19th (Gallery Night) : 9:30AM- 9:00PM Saturday December 20th- 9:30AM-5:30PM Sunday December 21st- 12PM-4PM Monday December 22nd- 9:30-5:30PM Tuesday December 23rd- 9:30-5:30PM Wednesday December 24th (Christmas Eve) 9:30AM-5:30PM Thursday December 25th- closed Friday December 26th – closed Saturday December 27th closed Sunday December 28th- closed Elebash’s will reopen for regular hours on Monday December 29th! We want to spread the joy this holiday season! 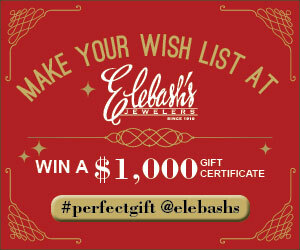 Anyone who stops in and fills out a wish list of their favorite Elebash’s items will be entered to win $1,000 gift certificate. The prize will be given away on December 20 – just in time to help make someone’s wish come true. We want you to stop by, browse what’s new, and make a wish list of your favorites. It might be something that makes a perfect Christmas gift, or something for an upcoming birthday or anniversary. As another fun way to share “hints” about your ideal gift, you can take photos of your “wish list” selections and post them on Facebook, with the tag #perfectgift @elebashs. Wish lists are available anytime we are open, 9:30 a.m. – 5:30 p.m., Monday – Saturday. Entries must be filled out by December 19 with a limit of one wish list per person. Elebash's named "Best Place to Buy an Engagement Ring"
Thanks to Independent News readers for naming us Pensacola’s “Best Place to Buy an Engagement Ring” in the 2012 Best of the Coast Awards!